Commuters are so regularly using travel time for work emails that their journeys should be counted as part of the working day, researchers say. Wider access to wi-fi on trains and the spread of mobile phones has extended the working day, a study from the University of the West of England says. The study examined 5,000 rail passengers on commuter routes into London as wi-fi became more available. "I am a busy mum and I rely on that time," one commuter told researchers. "It's really important to my sanity that I can get work done on the train," she said, on the Aylesbury to London route. The study, to be presented at the Royal Geographical Society on Thursday, found that 54% of commuters using the train's wi-fi were sending work emails. Others were using their own mobile phone connections for work emails. Those on the way to work were catching up with emails sent ahead of the coming day - while those on the return journey were finishing off work not completed during regular working hours. Image caption Is it damaging for a work-life balance if people are expected to answer emails before and after work? "It's dead time in a way, so what it allows me to do is finish stuff and not work in the evenings," said a commuter on the London to Birmingham route. 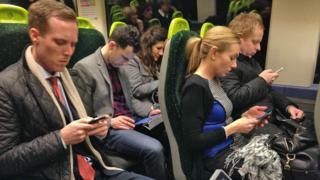 The study examined the impact of free wi-fi being upgraded on the London to Birmingham and London to Aylesbury routes. It showed that as internet access improved it had the effective consequence of extending working hours, using laptops and mobile phones. For commuting parents, it was also seen as a "transition", where they switched roles from being part of a family to a working environment. There were other commuters who liked the "buffer" of being able to work when travelling. "The majority of the time it's an option for me to, you know, clear the decks for the day, relax and put work behind me more than anything else," said a passenger on the London to Birmingham route. But the findings raise questions about the work-life balance - and whether it is healthy to stretch out the working day with people routinely answering emails beyond office hours. If the journey has become part of work, should it also be recognised as part of working hours? Image caption Should people be expected to check work emails outside of work? Researcher Dr Juliet Jain said smartphones and mobile internet access had caused a "blurring of boundaries" between work and home life - and this now applied to the journey to work. "How do we count that time? Do workplace cultures need to change?" she asked. Instead of technology giving people more flexibility over working, the study showed that people were working extra hours on top of their time in the office. "There's a real challenge in deciding what constitutes work," said Dr Jain, from the university's Centre for Transport and Society. Counting the journey as work could "ease commuter pressure on peak hours" travel, she said, allowing more staggered travel times. But Dr Jain said it would also mean that employers would want "more surveillance and accountability" for how commuters were spending that time before arriving at their desks. Business leaders recognised the difficulties of setting boundaries around such work emails and mobile technology - and warned it could damage productivity if work became too pervasive. "This increasing flexibility has the potential to radically shift the work-life balance for the better - but it also leaves open the door to stress and lower productivity," said Jamie Kerr, of the Institute of Directors. "With the concept of clocking on and clocking off no longer straightforward, defining where leisure begins and work ends will be vital for both employers and individuals, as well as a complex task for regulators." Matthew Percival, the CBI's head of employment, said: "A common-sense approach is needed, giving individuals the tools to manage their work-life balance."